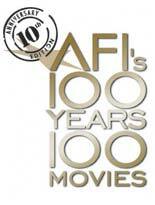 The American Film Institute in Los Angeles, California, in 2007 honored and updated its "definitive selection of the 100 greatest American movies of all time" from 1998, as determined by more than 1,500 leaders from the American film community. Feature-length: Narrative format typically over 60 minutes in length. American film: English language, with significant creative and/or financial production elements from the United States. Major Award Winner: Recognition from competitive events including awards from peer groups, critics, guilds and major film festivals. Popularity Over Time: This includes success at the box office, television and cable airings, and DVD/VHS sales and rentals.